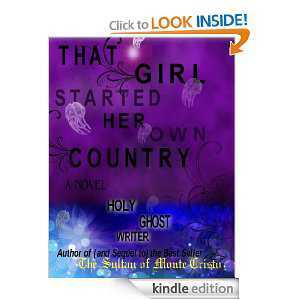 I was really ecstatic and overjoyed while reading "The Girl Who Started Her Own Country"! It is one of those books that once you get into the flow of it, you will not want to stop reading and I think that I may have never read a book as fast as I did with this one. The storyline is fantastic and it kept me griped from the start all throughout the whole book. I truly got lost in this book which is a thing that rarely happens to me. My only wish is that this book was longer as I didn't want it do end. A book that is worth every time you invest and engage in reading it - it's every reader's climax adventure - suspense - thriller experience! Well, honestly, at first, I was not familiar with the Holy Ghost Writer until this book but certainly, I will have to check out other works by HGW. Zaydee is a very slick character (and she's female, which makes it that much more interesting). Great characters (Steven and Zaydee are well developed) and if you're a fan of thrillers and suspense (like myself), this book is why you read them. It has well-written storyline and fantastic plot that brings you unlimited imagination and adventure.